In more detail, it's really an open source system for making such computers, which are called microcontrollers. The Arduino organization has taken this system and made a couple Arduino microcontrolers that you can buy, but the idea is that you can take their plans, parts, and ideas and make your own if you want. 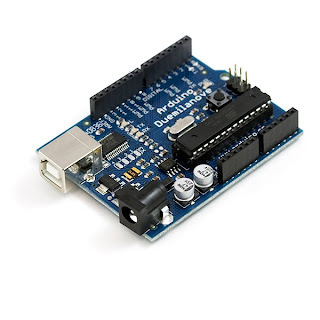 This has been very popular in the hobby world and many people have built other versions, helped the Arduino organization with their development, and mostly made other devices to be used as "addons" for the microcontrollers. There are a couple Arduinos that are available to buy: the Duemilanove, Mega, and Nano, and Lilypad. The Duemilanove is the "normal" sized one in terms of input/output ports and memory, the Mega basically has more of everything compared to the Duemilanove, the Nano is designed to be very small and you need to connect to it manually, and the Lilypad is designed for use in fabric or clothing. Arduino is great because it offers a clear, easy, cheap way of doing projects and experimentation. There is lots of documentation and help and you are free do go at your pace. It's cheap (the Duemilanove costs $30! ), although you do need to buy lots of "accessories" like wires and motors that you actually do stuff with. The programming experience is also really great. Arduinos are programmed in the C programming language and the software you can download is very nice and simple. I've worked a little bit with other C programming software and they are very detailed and "heavy duty," which is very hard to learn with. The Arduino software interface is very simplified and there is lots of help out there to teach you how to program. So I'm very happy with Arduino because it is a great resource for projects and offers a very good learning experience. I'd recommend it over anything else to someone who was interested.